As election day nears, dirty tricks surface. Flyers are left on cars telling Democrats that they should vote on Wednesday, not Tuesday. Anonymous automated phone calls warn people that they will be arrested at the polls or that their polling places have moved. The impact of such gambits is usually small, and in an increasing number of states, such tricks are punishable by law. A more insidious type of misinformation starts months earlier with local officials. Last March, the president of Colorado College in Colorado Springs received a letter from the El Paso County clerk, Robert Balink, warning that out-of-state students cannot register to vote if their parents claim them as dependents in another state. This was false. The registrar of elections for the area around Virginia Tech issued other confusing messages to students there, obliquely suggesting that their parents' tax status could be jeopardized based on vague state-board-of-elections guidelines. A widely circulated anonymous e-mail warns voters that they will be turned away from polling places if they wear a barack obama button or a john mccain T shirt. This is true in only a minority of states. 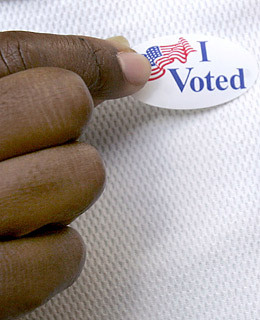 In Virginia, for instance, wearing a candidate's T shirt or button can get you tossed from a polling place. After agreeing to the policy, Virginia Board of Elections officials said decisions about what to do will be subject to the interpretation of local poll workers and judges  which is a pretty good metaphor for the controlled electoral chaos that is about to unfold all over America in a few short days.